For most of us who work long hours behind the desk, one of the most common conditions is shoulder (Scapular) or neck aches and dull pain. The aches and dull irritating pain clings on despite the many massages and stretches. I, like some others, used to conveniently reach out for paracetamol or ibuprofen to cope with the conditions frequently. So convenient, but we-know-oh-so-wrong. A better alternative to reduce and cope with the pains and aches is Pilates training. The shoulder blades are two flat, triangular bones on each side of the top of the back. They are connected to the upper arm bones (humerus) and to the collar bones (clavicle). 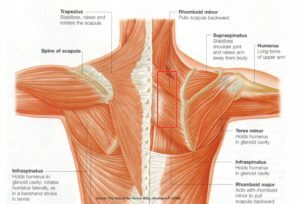 The shoulder blades are layered with connecting muscles – rhomboid as primary on the upper back, trapezius that connect shoulder blade to the neck and deltoid that bridges the shoulder blade to the upper arm. Let’s look at the evidence-based study findings for shoulder aches and pain and how Pilates can help before we move on to understanding neck pain and aches. What causes neck and shoulder aches and pain? “One of the major causes of aches and pain in the shoulder blades for working population is bad posture,“ said Kevin Bowen, Owner and Director of Core Dynamics Teachers Training Program and past President and former executive Director of the Pilates Method Alliance (PMA), the first global community that help certify Pilates instructors. Shoulder aches and pain may also be due to psychological stress, shoulder overuse, injuries, pinched spinal nerves, lung diseases and disorders of other chest and abdominal organs. How does Pilates help lessen shoulder aches and pain? Todd pointed out that the movements of the body are mainly controlled by the lumbar and deep pelvic muscles. It is therefore essential to increase the stability of the lumbo-pelvic region to increase functional movements of the shoulder which may help improve the stability of the scapular region. Stabilization of the scapula is needed for daily movements of retraction and depression of the scapula and assisting the acromion to be positioned correctly (Todd, 1980). Stability is critical for optimal muscle contraction. Muscle is attached at both ends to the bones. If there is absence of muscle stability at either end of the muscle, it will not be able to produce an efficient movement. The stabilization of one end of the muscle allows the powerful contraction to be focused on the moving lever. In this way, the intended movement is performed by the recruitment of only a few muscle motor units (section of muscle that is controlled by the brain neuron instructions), thereby making the movement easier and more efficient (Fitt, 1996). Pilates exercises are shown to be more efficient in relieving pain and improving function than conventional exercises in 2 weeks. 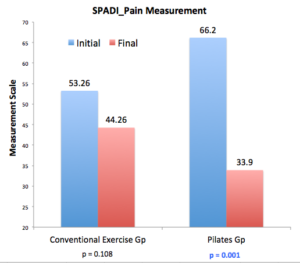 In a randomised controlled clinical study by Atılgan et al on middle-age patients with shoulder pain lasting at least 4 weeks, there was significant improvement on shoulder pain and disability measurement after Pilates exercises than the Control group going through conventional exercises (Atılgan, Aytar, Çağlar, Tığlı, & Ünal, 2017). There were no significant differences in age, BMI and gender between the groups. The severity of pain was evaluated at rest and during activity using Visual Analogue Scale (VAS) Shoulder Pain while Disability Index (SPADI) were also used to evaluate the shoulder pain and disability. The study also found there was no significant change in SPADI-Pain and SPADI-Disability scores in the conventional group. The Pilates group exercises include scapular stabilization and glenohumeral joint mobilization in the direction of flexion, abduction and internal-external rotation with breathing control, while the conventional exercise group performed pendulum exercise, wall flexion and abduction stretch and active range of motion exercises in the flexion, abduction, and internal and external rotation direction. 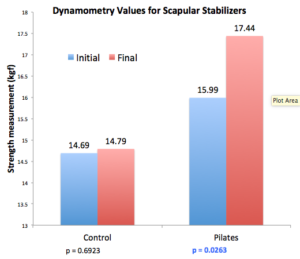 Increased strength of the scapular stabilizer and lumbar muscles after 12 sessions of Pilates training. 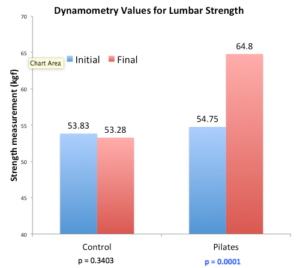 Santos et al concluded in a randomised controlled clinical study that there were improvements in scapular stabilizer and lumbar extensor strength vs control group after 12 sessions of Pilates training (Bertoncello, 2016). The Pilates group undertook a series of stretching and Pilates exercises on the reformer with each session lasting about an hour. The Pilates exercises include footwork toes, Leg series (One Leg), Hundred, Arms Pulling Down, Arms Pulling Straps and Shoulder Bridge. The Control group did not attend the Pilates training session. There were n significant differences between the two groups for age and other measurement variables before trial. Santos et al found that in the case of the trained group, there were significant differences (95% confidence level) betweel the strength values for the scapular stabilizers and lumbar obtained at the beginning and end of the training. Statistically significant differences were also observed between the final values obtained for the two groups. The occurrence of neck pain increases with age (Bovim, Schrader, & Sand, 1994), and it is more commonly seen in females (Fejer, Kyvik, & Hartvigsen, 2006). The main causes are poorly understood but stand to be multi-factored – with poor posture, anxiety, depression, neck strain and sporting or occupational activities. Pilot study’s preliminary evidence indicated Pilates can alleviate chronic neck pain. In the pilot study by Murphy et al, the preliminary evidence indicated that Pilates can effect long-term changes in pain and disability in chronic neck pain (Murphy, 2013). Subjects participating in the study were aged 37-59 year old with a history of neck pain of greater than 6 weeks duration or recurring neck pain consisting of pain for at least one week per month over the previous four months. Subjects attended an hourly Pilates class once weekly for 6 weeks, following a series of 10 Beginner Pilates exercises. 1. Hip Twist Level 1. Right knee moves away from and then towards midline while maintaining a neutral spine position. 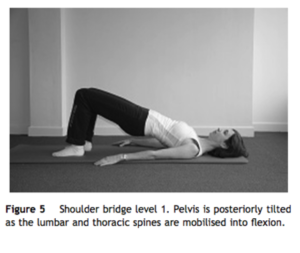 This challenges rotational control of the lumbar spine Fig. 2. 2. Double leg stretch Level 1. Arms are lowered overhead as far as control of the ribcage and pelvis can be maintained. 3. Double leg stretch Level 2 Fig. 3. As for level 1 but simultaneously sliding the left heel along the mat away from the body. 4. One leg stretch Level 1. The left heel slides along mat extending left leg without allowing the pelvis to anteriorly tilt. 5. Clam Level 1-Fig. 4. Posterior fibres of gluteus medius are isolated as the top knee is slowly lifted towards the ceiling while keeping the pelvis still. 6. Shoulder Bridge Level 1 Fig. 5. Pelvis is posteriorly til- ted as the lumbar and thoracic spines are mobilised in to flexion. 7. Scissors Level 1. The left knee is lifted over the hip (90 degrees angle at knee and hip) while keeping the pelvis in neutral. 8. Arm openings Level 1 Fig. 6. 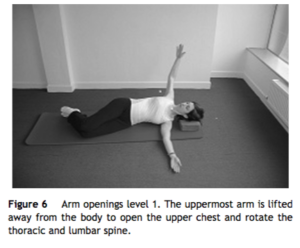 The uppermost arm is lifted away from the body to open the upper chest and rotate the thoracic and lumbar spine. 9. Breast stroke prep Level 1 Fig. 7. 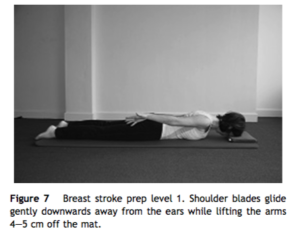 Shoulder blades glide gently downwards away from the ears while lift- ing the arms 4e5 cm off the mat. 10. Breast stroke prep Level 2 Fig. 8. 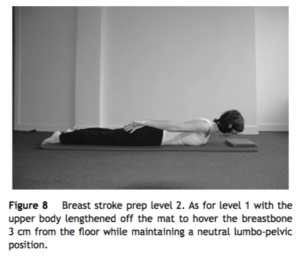 As for level 1 with the upper body lengthened off the mat to hover the breastbone 3 cm from the floor while maintaining a neutral lumbo-pelvic position. Keep the back of the neck long. This exercise retrains co-activation of the deep neck flexors and extensors with upper, lower trapezius and serratus anterior. Neck pain was measured using Numerical rating pain scale (NRPS), a self-reporting outcome measurement where subjects rate their pain on a single 11-point scale from no pain at 0 to severe pain 10. Neck disability was also measured using a neck disability index (NDI) – a 10-item questionnaire measuring functional disability. 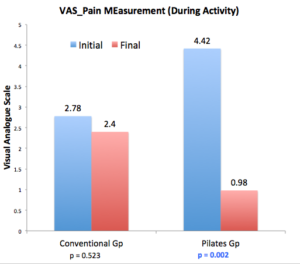 There was significant decrease in NRPS after 12 weeks, and significant improvements at 6 and 23 weeks for ND, suggesting that the supporting use of Pilates as an intervention in chronic neck pain patients. So, try out Pilates to reduce your neck or shoulder aches and pain. We would recommend you to start with private or customised Pilates for focus purpose as a start. With the right movement instructors , Pilates can help towards alleviating your shoulder and neck aches and pain – not to mention the other health benefits that come with it. Atılgan, E., Aytar, A., Çağlar, A., Tığlı, A. A., & Ünal, E. (2017). The effects of Clinical Pilates exercises on patients with shoulder pain: A randomised clinical trial. Journal of Bodywork and Movement Therapies, 1-5. Fitt, S. S. (1996). Dance Kinesiology, Second Edition: Schirmer Books. Murphy, G. M. S. (2013). 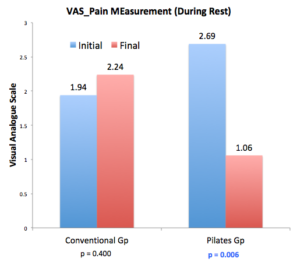 The effectiveness of a 6-week Pilates programme on outcome measures in a population of chronic neck pain patients- A pilot study. Elservier, 17(3), 376-384. Todd, M. E. (1980). The Thinking Body: Study of the Balancing Forces of Dynamic Man: Princeton Book Company.